Hi, I am interested in your 1951 Hudson Hornet (stock #1728-TPA) listed on Autotrader for $29,995. I'd like to get more information about this vehicle and confirm its availability. 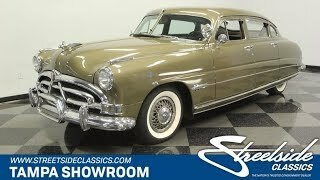 The Hudson Hornet is a true motoring legend, and the 1951 model year is the one that started it all. So to have such a complete example that has all the right pieces right down to the famous performance inline-six is a real treat. The Hornet was the ultimate expression of a new era at Hudson. The body was specially built to be channeled over the frame to give it an extra low stance, and the sheetmetal was pure jet-age streamlining. Thats what made them so special, and also why this example has been treated with such respect. Thats why the panels line up nicely and all four doors close with authority. And we all love the brightwork. The intricate grille, wraparound bumpers, wire wheel covers, special Hornet badging, and full-length trim that zooms past the rear wheels it all has a great look of originality. Even the details are great, like the spotlight, center antenna between the two-piece windshield, rain guards over the doors, and the streamliner hood ornament. And its all finished off in a golden hue that has the right touch of metallic element to really send everyones nostalgia into overdrive. The step-down body meant these cars coupe look low and sleek while still offering plenty of space inside. Hornets were known for striped cloth with button-top finishes, and so the seats do its history justice. Plus, the door panels, carpeting, and headliner all have a nice feeling to make this a fantastic cruiser. Youll love slipping behind the classic steering wheel with Hudson center cap. And you get to gaze across the stylized classic dash that has all the right pieces, including the heat/defrost controls, AM radio on display, and the artful full gauge package. Under the hood, the golden block really likes to showcase the special motor. Hudsons 308 cubic-inch straight-six was famous for being the largest six-cylinder motor of the era. Hudson fans know the importance of those two bold red air grabbers for Twin-H Power. This feature wasnt available until the following year, but its hard to blame anyone for adding this cool upgrade. Plus, it was done correctly with twin Carter carburetors. The motor fires up nicely with a great low tone. And the two-speed automatic transmission helps ensure this legendary sedan is a nice cruiser. The movie Cars might have endeared the Hornet to a whole new generation of car loves, but we all know it was something quite special way before then. So dont miss out on such a complete and clean example of a first-year Hornet. Call today!! !